Bioware has a long history of bringing thrilling fantasy-based role playing games to life with titles like Neverwinter Nights ( ) and Baldur’s Gate. The company has made its bones by closely adhering to real Advanced Dungeons & Dragons rules, creating a “legitimate” role playing game (RPG) experience that still has all the thrills and action of a computer game. They also thrilled Star Wars gamers with Star Wars: Knights of the Old Republic ( ). Jade Empire: Special Edition, a game that originated on the Xbox, made its way to the PC in 2007 and finally ended up on the Mac this past summer, is most definitely a Bioware game. The game is inspired by Asian history and mythology, and while it feels a bit hackneyed at times, it’s still an engaging and fun romp that might merit your attention. And while it’s been stripped down compared to an “official” D&D game, it’s still very much an RPG. You start out as the promising apprentice to a wizened old martial arts master (really, who doesn’t these days), and you find yourself thrust into the limelight as you defend your town against invaders, thus setting off a cascade of story elements that peel apart much of the convoluted (and alternately funny, sad, adventurous and heroic) plot devices you’ve seen in countless Hong Kong martial arts epics over the years. If you’ve played Knights of the Old Republic, you’ll be familiar with a concept that’s recycled for Jade Empire: moral ambiguity. You can make positive or negative decisions that will affect your standings with others, and in turn, will direct you down two different alignment paths within the game, unlocking new story elements, capabilities and rewards. It isn’t presented as “good versus evil” - instead, it’s “closed fist” choices (often aggressive and can carry with them some sort of extreme negative connotation), and “open palm” ethical choices (more noble and upstanding). You’ll need to choose a weapon and fighting style, and three main attributes-Body (health), Chi (magic powers) and Focus (special combat techniques)-help you succeed at what you do. You can learn a wide range of techniques, everything from wielding specialized weapons like a master to understanding the arcane arts and mastering shape-changing ability or the control of the elements. You’ll need different styles and weapons to combat different foes, so it’s a good idea to learn as much as what suits your particular playing style. Mouse and keyboard control is very effective, especially compared to the game’s gamepad basis on the Xbox. They’ve carried over an intuitive targeting system that will help you focus on who (or what) you have to fight quickly. You carry on conversations with computer-controlled characters through branching dialogue trees, but it’s worth noting that those conversations (as well as the action that unfolds around them) are pretty linear. They’re there to dress up the story a bit, but not much more. You’ll need to study up on several different fighting styles to make it all the way to the end of Jade Empire. Billed as a Special Edition, this version of Jade Empire has features you won’t find in the original Xbox release, which is now more than three years old. It sports new enemies, new story elements, new fighting styles and other content, so there’s definitely something new to the experience even if you’ve played this game on the console. I did run into some trouble getting Jade Empire running on my Mac; something didn’t sit well when I tried to register it using the registration code provided through the GameTree Online. It took some back and forth with the company’s support to figure out what the problem was and how to fix it (I had to navigate to a preferences directory and delete a file that had somehow gotten damaged). Everything in Jade Empire looks and sounds beautiful; both the graphics and audio engineering are top-quality. You may even recognize some of the voice actors; Monty Python alum John Cleese makes an appearance as Sir Roderick, while Nathan Fillon (of Firefly, and more recently, Dr. Horrible’s Sing-Along Blog) is also featured. 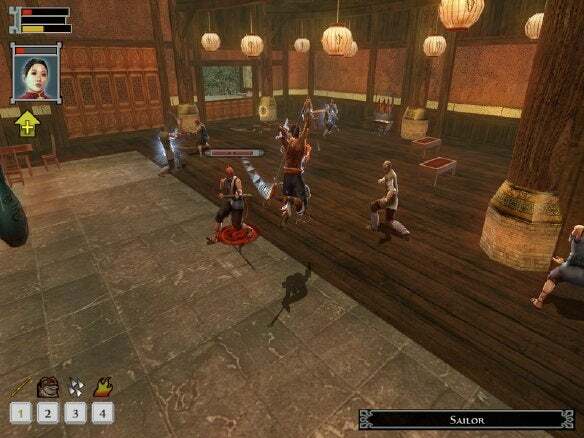 For now, the best way to get your hands on Jade Empire is to buy it online and download it through GameTree Online, the e-commerce site owned and operated by TransGaming, the company which brought this title to the Mac. Jade Empire, which involves a lot of bloody hand-to-hand combat, has been rated M for Mature by the ESRB, making it suitable for players age 17 and older. As with other TransGaming Cider game conversions, this title requires an Intel-based Mac. Though it’s worth noting that systems with Intel GMA X3100 or better 3D graphics cards can play this, so you can give it a try on previous-generation MacBooks and MacBook Air systems. Jade Empire is several years old and the bloom may be off the lotus flower for some, especially Xbox gamers who have already played it. But for others, Jade Empire offers a lot of fun action and adventure in a martial arts movie-inspired setting, created by true masters of the modern action RPG genre.